Escape the crowds and enjoy the day in a tropical paradise as we take you on an eco-tour of discovery to explore the crystal clear waters of the Moreton Bay Marine Park. Escape the crowds and enjoy a day in a tropical paradise as we take you on an eco-tour of discovery to explore the crystal clear waters of the Moreton Bay Marine Park. The Moreton Bay Marine Park is home to a myriad of marine species including over 300 Bottlenose Dolphins, giant Loggerhead Turtles and the endangered Dugongs. This amazing Marine Park is also on the migratory path of the majestic Humpback Whale which visit these waters between the months of June to November. 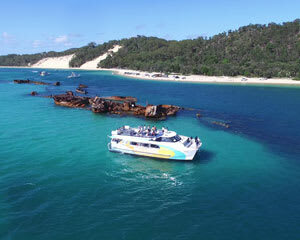 Join our guided snorkel tour and be amazed by the abundance of marine life that inhabit the Tangalooma Wrecks and walk on the beautiful white sands of the Moreton Island National Park.